• What Chef and Entertainer Can Resist the Spacious Kitchen with Granite Counter Tops, Double Sink, Stainless Steel Appliances including Newer Electric Oven (2016), Tile Flooring, and Convenient Breakfast Bar: For Added Convenience, You Can Pass Through Trays of Food and Drink Through the Window to The Back Deck! Best for homeowners and land developers! 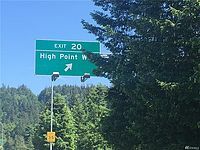 HIGHPOINT exit is just east of the Highlands Drive exit. Enjoy your own I90 exit and with a short drive home. Super convenient access to this property with two options for ingress and egress to the lot. Look for arrow signs to indicate entry points. The two possible entrance points need to be verified and identified by all state and county authorities. Seller has old documentation and is available upon request regarding a septic system doable with water, well hookup. This will need to be researched by buyers and verified through the proper channels. Lot was partially cleared, beautiful setting, with approx 12 homes in this community. There is a HOA governing the community and each homeowner is responsible for maintaining their portion of the roadway contained within their property limits. In addition, a HOA fee is collected to help offset maintenance costs. Come Home to This 1,433 Sq. Ft., 3 Bedroom, 2 Bath Rambler on A 10,723 Sq. Ft. Lot, Nestled in The Renton Highlands and The Highly Rated Issaquah School District – With Both Coveted Amenities and Newer Upgrades, It’s Move-In Ready! Entertain in the Spacious Living Room with Hardwood Flooring and Handsome Wood-burning Fireplace with Hand Crafted Mantel and Hearth, with Built-in Bookshelves- You and Your Guests Will Stay Cool and Comfortable Even On A Hot Day, Thanks to The Air Conditioning! Great Location in A Quiet and Friendly Neighborhood: Close to Popular Apollo Elementary, Cougar Mtn., Tiger Mtn., and Squak Mountain Parks, Downtown Renton and Bellevue with Their Numerous Restaurants, Shopping and Entertainment Options, with Easy Access to I-405, Hwy. 169, and I-90. Quality Shows Throughout This Two-Level Home in Desirable Spiritridge Community! This Spacious Eastside Home is Ideally Located! This Light-filled 1,653 Sq. Ft., 3 Bedroom, 2-1/4 Bath Townhome features Soaring Vaulted Ceilings, Numerous Skylights, 6-Panel Doors, New Interior Paint and Upstairs Carpet, High Efficiency Gas Furnace, Updated Dining Room and Entry Lighting, and All Appliances Stay – This Home Simply Awaits Your Very Own Personal Style! Closed on 1/23/19 for $635,000- less than 1 week on the market!! • Enjoy Easy Parking Into The Attached Garage – Stay Dry When Unloading Your Car! • Sorrento Neighborhood HOA Dues: $440/Mo. Includes W/S/G, Earthquake Ins./Roads, Grounds, Common Area & Lawn Maintenance/Roof-Gutters Cleaned – Issaquah Highlands HOA Dues: $75/Mo. • Issaquah Highlands Is Known For Excellent Schools, Great Neighborhoods, Community Center, Numerous Trails, Open Spaces, Athletic Amenities, and Nearby Restaurants and Shopping – Quick Access to I-90, Public Transportation, and Minutes to Seattle and Bellevue. This is a Rare Gem: 3 Bedroom, 2 Bathroom, Home Nested on a Sensational Sun-lit Lot. Close to Shops, Buses, Eastgate Park & Ride and Just Minutes to: I90, 405, Bellevue College, T-Mobile & more. Delightful Beautiful Hardwood Floors, Flowing Open Floor Plan, hi-quality Jeld-Wen Solid Doors and a Spacious Master with Full Bath and Jet Tub. Enjoy NEW paint on Exterior and Interior. Don’t miss the CUTE-Detached-Studio or Office. New Roof Decks Fridge and Luxury Plank floors in Baths and Kitchen. Bellevue Schools with Newport Senior High! Just Imagine the Possibilities with The Fully Fenced Rear Yard – Enjoy Summer BBQs, Add Raised Garden Beds, or Include a Kid’s Play Area! *Truly A Must-See, This Lovely 2,215 Sq. Ft. 4 Bedroom, 1.75 Bath Home is Showcased by Updates and Recent Improvements, Built-ins, And An Attention to Detail – Well Placed on A Spacious 21,600 Sq. Ft. Private Lot Filled with Lush Greenery and Several Outdoor Living Spaces You’ll Fall in Love With! * Quality Touches Throughout Include Hardwoods, Travertine, Crown Molding, White Paneled Doors, and Gas Furnace –Upgrades Include Tons of New Windows, Plumbing, Electrical, and Newer Roof. Immaculate, Updated Home Filled with Natural Light in Great Eastside Location! With an Exterior Reminiscent of A Chateau Style, This 2,850 Sq. Ft., 3 Bedroom, 3.25 Bath Home is Well Placed At the End of A Long Driveway on A 12,755 Sq. Ft. Lot Filled with Beautiful, Mature Landscaping and Room For Additional Parking, Creating Your Own Private Urban Oasis In A Quiet Neighborhood Just South of Seattle. Closed 8/24/18 for $791,000 - sold in 5 hours after hitting the market. • Don’t Miss Out on This Move-in Ready 1,930 Sq. Ft. 3 Bedroom, 2.5 Bath Home Showcased by A Comfortable Floor Plan on A Quiet Street – Well Placed on A Mostly Flat 7405,Sq. Ft. Lot That Backs Up and Overlooks Lush Greenery – Your Private Urban Oasis Awaits You! • In the Coveted Nortshhore School District! *Don’t Miss This One Bedroom, One Bath, 712* Sq. Ft. Home that Sets Up Off the Grounds in A Secured Building with Locked Mailboxes and An Elevator: 2018 Taxes $2,469 – HOA Dues $235/Mo. includes Building & Exterior Earthquake Insurance, Water/Sewer/Garbage, Pool, Sauna, Exercise Room, and Indoor/Outdoor Common Space Maintenance. *Lanai/Balcony Accessed Through the Slider – Enjoy the Views! This Unit Has One Deeded Uncovered Parking Space (#25) and A Storage Unit. 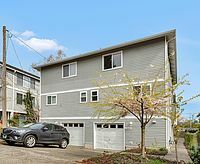 *Close to Discovery Park, West Point Lighthouse, Shops, Restaurants, Ballard and Downtown Seattle. Built in 1912, Recently Updated with Modern Lifestyles in Mind and Maintained to Perfection, This Home is Move-in Ready! Wrapped in A Serenely Secluded Setting, This Architectural Custom Home is A Rare Gem. *Don’t Miss The Opportunity To Live in This Comfortable Countryside Setting: A 2 Bedroom, 2 Bath, 1,870 Sq. Ft. Home with An Office/Shop & 1/2 Bath in Garage that Could Also Be Converted to A Larger Garage Space – Built in 1981 and Nestled Upon A 3.41 Acre with Approx. 1/3rd of The Property Both Professionally Landscaped and Level – Gorgeous Location Near Tiger Mountain State Forest and Squak Mountain State Park, with Easy Access to Issaquah’s Shopping, Dining & Entertainment. *Handsome Quality Exterior Slate Leads You Up Into The Entry, Wonderful Scent of Clear Cedar Walls – a Ceiling Fan Provides a Gentle Breeze to This Serene Setting That’s Perfect for Reading and Relaxing. *On Private Well and Septic, This Home Includes A Generator with Kill System (Never Lose Power!) and A Heat Pump for Those Hot Summer Days. The Beauty of Both The Natural Setting and Professionally Manicured Grounds Will Captivate You with Its Many Varieties of Trees (including Large Maples), Shrubs, and Flowers. The Circular Floorplan of This 3 Bedroom plus Loft/Office, 2.5 Bath, 1,922 Sq. Ft. Home is Both Light & Bright, and Sits On A Gracious 7,626 Sq. Ft. Lot – Built in 1998, Nestled in A Peaceful Cul-de-sac with Sidewalks and Surrounded by New and Newer Homes, This Great Location is Close to Mill Creek Town Center, Alderwood Mall, Everett, and Old Town Snohomish with their Many Shopping, Dining & Entertainment Options, and Local Highways. Any Family Will Appreciate the Open Floorplan of the Kitchen with Breakfast Bar and the Cozy Family Room with Fireplace, Making An Ideal Everyday Living Area – You’ll Find Easy Access trough the Adjoining Slider to the Large, Freshly Painted Deck and Huge Back Yard with Surrounding Greenbelt Privacy, Perfect for Summer BBQs and Badminton, with Plenty of Room for Everyone to Play. I-5 for Multiple Commuting Options. Updates Throughout and An Ideal Selection of Amenities. The Bright and Open Floorplan Of This One Bedroom, One Bath, 711 Sq. Ft. Home Provides You With A “Living Large” Feel – Built in 1995, This Coveted Top Floor Unit is Located Iin The Sundance Community in The Klahanie Neighborhood of Issaquah/Sammamish, One of the Region’s Hottest Areas – 2017 Taxes: $2,041 – No Rental Cap. HOA dues $242/mo and include: Water, Sewer, and Garbage. Immaculate ground floor end-unit with an amazing 1-car garage and storage! Former model unit with several upgrades: painted mill work, gas fireplace, large bath with tile accents. This home backs to and has views of protected greenbelt. The large patio is so inviting, private & peaceful, trails galore! Mature flowers & plants are maintained by the HOA. Sundance amenities include club house, pool and spa, workout & party facility. Prof cleaned & staged, FHA approved, no-rent cap, hurry this one is a GEM! Park-like setting on the patio is perfect for your morning coffee in your bath robe, it’s totally private! Convenient additional storage on the patio. Landscaped and Staged, It’s Move-In Ready! This Perfectly Charming 3 Bedroom, 2 Bath, 1,060+ Sq. Ft. Home Sets High Up on Its Private 3,090+ Sq. Ft. The home was built in 1905 but essentially in 2010 this occurred: rebuilt the entire house from the studs out including new furnace, all new floors drywall, and insulation in attic. Lot in One of Seattle’s Most Coveted Neighborhoods – MultiPurpose Front and Rear Yards, and Rear Alley Access with Tons of Uncovered Parking Not Far from Downtown with Its Many Restaurants, Entertainment, Sports Venues, and Shopping Options. A Welcoming Front Gate and Trellis Invites You to Enter The Freshly Painted Red Front Door – Inside The Home You’ll Find A Light-Filled Floor Plan with Fresh Neutral Paint Colors, Classic Coved Arches, Tall Ceilings, Newer Windows, Stylish White Molding, and Hardwood Floors Throughout. The Cozy and Stained Covered Front Porch Beckons for Relaxing Morning Coffee or To Simply Unwind on Warm Evenings. All the Right Spaces in All the Right Places. This Turn-Key Newcastle Rambler Deliveres! This Home Is So Much More Than It Appears from Outside! Enjoy The Clean Lines and Numerous Upgrades Throughout. Updates Include Newer Windows, Kitchen, Baths, 6-panel Doors, Furnace & Electrical Panel – Also Features Air Conditioning! You’ll Also Find Charming Accent Shutters, Tiled Entry, Hardwood Floors, and Mouldings that Further Enhance This Home’s Style. This Home Is Set Upon A Cul-de-Sac Down A Lovely Street, and Close to All The Amenities You Could Want. With Its Expansive Setting, Hardwood Floors, and Walls of Windows Filling the Space with Wonderful Natural Light, The Adjoining Family / Kitchen / Dining Areas Provide An Ideal Setting for Everyday Spacious Living – Both A Spiral Staircase and Standard Step Staircase Lead You to The Upper Level. In Issaquah, One of The Region’s Hottest Communities, with Easy Access to Great Schools, Shopping, Restaurants, Regional Employers – I-90 and I-5 Make Seattle and Bellevue Convenient Commutes. 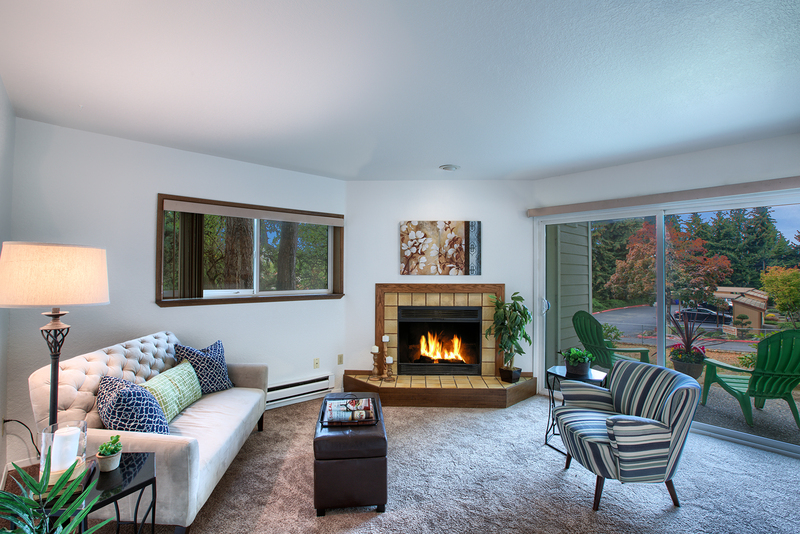 Beautiful updated 1 bedroom 1 bath condo in Sammamish Sundance. Top floor corner unit with vaulted ceiling in living and master, master is a generous size can house a king size bed, walk-in closet with new shelving. New tile shower with Carerra decorative marble and subway tiles. Kitchen has all new paint and new flooring and huge pantry plus all appliances stay. Enjoy upgraded brushed nickel hardware and size-panel doors. Classic molding-trim package throughout open living room with vaulted ceiling and protected GB views. Picnic deck- serene views of protected green belt, chic window blinds, little dining room with chandelier. Tiled corner gas fireplace with TV cut out, grounds are meticulous! Sundance has a delightful set of amenities: a cabana, gym; future hot tub facility, bathrooms, outdoor pool access and a great room with kitchen and big screen TV. Abundance of open parking has allowed this homeowner with 3 vehicles to park immediately adjacent to his building. Additionally, there is ample safe overflow and visitor parking found on Klahanie Boulevard year-round. Floorplan in This Light-Filled Home with Fenced Back Yard. *Don’t Miss This Ready to Move In Craftsman-style, 4 Bedroom, 2.5 Bath, 2,620 Sq. Brand New All the Way to The Studs: Fall in Love with Gorgeous Rich Hardwoods & Bright Designer Accents! Don’t Miss This Rare Gem: 3 Bedroom, 1.75 Bath, Home Nestled on A Sensational Sun-lit Corner Lot with Fully Fenced Rear Yard – With A Functional Interior That Joins Hands with Modern Design That’ll Make You Proud – Located Near Totem Lake’s Medical Opportunities, Lake Washington Schools, and Updated Shopping Mall! Featuring A Long List of Brand New Elements: Recessed Lighting, Hardwood Floors, Both Baths, Gas Furnace, Hot Water Heater, Walls, Doors, Windows, Paint, Lighting, Insulation, and Wiring – Absolutely Move-In Ready! Fabulous Totem Lake and Kingsgate Location, with Shopping, Restaurants, Entertainment, Parks, and Transportation Nearby – Close! Home in the Heart of Factoria & Close to Everything! Come see this sparkling large 2 Bedroom, One Bath Home Is The Coveted End Unit Setting with Windows on Three Sides , and Is Filled With New Features – Set Near Factoria Mall, Regional Employers, Commuter Routes, Public Transportation, and In The Highly Rated Bellevue School District including Newport High School – This Condominium Is Simply Hard to Beat! Set in the Popular Factoria Neighborhood of South Bellevue, Where Convenience and Location Blend Together with Shopping, Restaurants, Entertainment, Parks, & Transportation – Easy Commute to Downtown Seattle or Bellevue via I-405 and I-90. Bright & Open Spaces Fill This Classic Home Featuring Seamless Indoor/Outdoor Living! Located in A Desirable Bellevue Neighborhood with Top-Rated Schools, Glendale Country Club and Kelsey Creek Farm. An Elegant Wood Burning Fireplace Highlights the Light Filled and Spacious Living Room with Open Floorplan That Includes the Entry and Dining Areas. Fabulous Bellevue Location, with Shopping, Restaurants, Entertainment, Parks, Transportation, and Downtown Bellevue Just Blocks Away and An Easy Commute to Away and An Easy Commute to Downtown Seattle or Issaquah via I-405 and I-90. Gorgeous Home Filled with Quality Updates & Finishes in Desirable Bellevue Neighborhood. A Completely Remodeled Main Floor With A Peek View of Phantom Lake Make This Stunning Home A Rare Find! Beautifully Updated 3,420 Sq. Ft., 5 Bedroom, 3.25 Bath Home with MIL Potential (2 Beds Downstairs includes 1 Full Bath, Laundry, Access to Back Yard, and Office Space) – The Fully Fenced and Spacious Rear Yard with Deck and Patio Area Make An Appealing Urban Oasis – Set in the Sought-after Phantom Lake Neighborhood! With 2 Charcoal Built-in Task Desks, Lots of Outlets, Storage and Plenty of Natural Light, You’ll Find The Office Nook A Great Space for Work or Study. With Numerous Professional Updates, This Special Home, Offers A Private Oasis Close to Ballard’s Amazing Amenities. Plenty of Parking For Your Boat or RV. Tons of Improvements Both Inside and Out. A Phenomenal Find in Cambridge Pointe, This 4 Bedroom, 2.5 Bath Home with Nearly 2,200 Sq. Ft.* of Flowing & Bright Living Spaces is Perfectly Nestled on A Fully Landscaped Flat Lot with Attached 2-Car Garage – Your Own Urban Oasis Awaits! • Two Bedrooms and 1-3/4 Baths are Also Located on The Main Floor. • Enjoy Games and Gardening in the Sunny, Flat and Fully Fenced Back Yard with Beautiful Landscaping – Just Waiting for Your Summer Adventures! • You’ll Appreciate the Appeal of The Office/Hobby Room, Charming Loft and Sunken Extra Finished Room – Loads of Potential in These Extra Spaces! Welcome home to the popular “Spiritridge” neighborhood! Newer wrap deck with Timertech material makes a lovely place to sit and watch the views while entertaining and watching the 4th of July fireworks show! Property line goes way down the hill to the cyclone fence, very natural and perfect for building forts, trail walking and summer fun! Very private setting with garden beds and mature plants, trees and shrubs. A gardener’s delight! Large great room/living room dining room combo with wood burning fireplace and brick surround. Top rated Bellevue schools with award winning Spiritridge Elementary school only a short stroll away! Here are some seller favorites! Shockingly Spacious Town Home in Convienent Maple Leaf Location! Take advantage of this rare opportunity! This townhome features two bedrooms, a bonus room, entry, and more. There is even a garage with additional storage and bike racks, plus additional parking in the driveway and nearby! All appliances stay including the Refrigerator and Washer which are under 2 years old. This rentable townhome is a short walk away from Maple Leave Park, Shopping, and - of course - Starbucks. A variety of new features also grace this perfectly located home! • 2 forks of the Issaquah Creek run through the property, joining together just past a waterfall. New Carpet and Interior Paint Makes This A Move-in Ready Home! The two bedrooms on the lower level need carpeting. Beds: 5 Baths: 3.5 Lot Size: 5.88 Acres Sq Ft: 3980 approx. This home was tastefully crafted in 1990 with walls of windows, skylights for max natural light. Impressive tall soaring 20ft ceilings dramatic entry with gleaming hardwoods throughout the main floor and in excellent condition. - Traditional outlay with four beds up and 2 full baths. - Cascade and Lake Sammamish views to wake up to. - Master has huge walk-in closet, recessed ceiling. - Marble tile surround, soaking tub with jets and dual sink vanity. - Abundant huge storage in garage and crawl space. - 3 car garage ½ bath on main for guests and another ½ bath in large laundry room w/handy utility sink. - Well maintained, beautiful landscaping with mall apple tree, Rhodes, lilacs, iris, hydrangeas, and lavender. - Located in the high demand Bellevue school district with Newport high assigned to this address. - New 30 year roof installed in 2010! Sits Proud at the End of a Cul-de-sac. Hi-Tech Smart Home with a Traditional Flair, Oozing with Class and Thoughtful Upgrades. Restful, Spa-like Master Suite with Lake and Mountain Views has Two Closets. Media fun Home Theater with 3D 122" screen plus Surround Sound. Don't forget the Attached Three Car Garage Either! View the Inside in More Detail with this 3D Virtual Tour! Simply GORGEOUS 1959 Home with Bright Open Floor Plan and Upscale Touches Throughout, Overlooking Fenced Back Yard. An Exceptionally Clean Treasure, This 4 Bedroom, 1.75 Bath, 2,015 Sq. Ft Home Was Updated with Easy Modern Living in Mind – Well Designed Back Yard Layout Offers Relaxation and Play Areas as Well As Privacy. An Elegant Living Room is Highlighted by The Classic White Mantled Wood Burning Fireplace and Hardwood Floors. West Seattle Craftsman located near it all! Fall in love with this updated Craftsman located near it all! 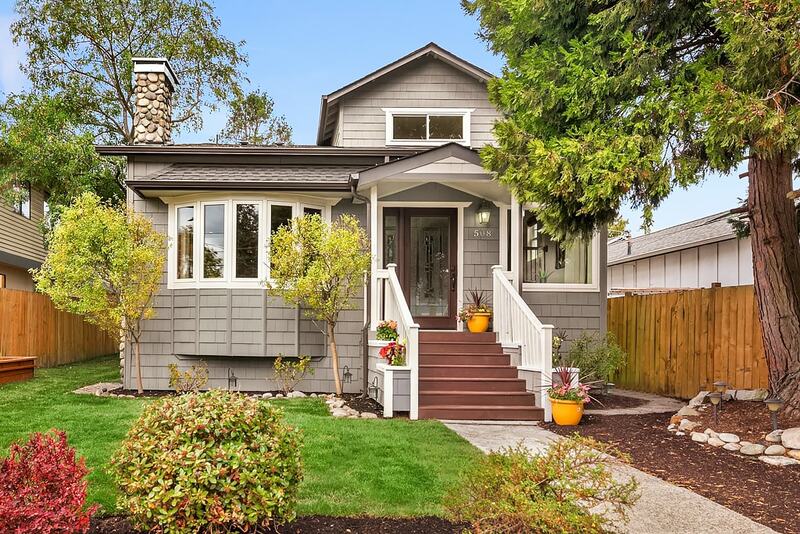 Marvelous Touches & Great Floor Plan Distinguish This Classic 1919 West Seattle Style Home. Don’t Miss Out on This Simply Immaculate 1,650 Sq. Ft. Home Featuring 2 Bedrooms and 1.75 Baths with 2 Bonus Rooms on Upper Floor: Imagine the Potential! Simply Beautiful Home Filled with Craftsman Style: Glass Doorknobs - Rich Fir Trim - Hardwood Floors. Don’t Miss This Hard to Find, Well Built Historic 1925 Bothell Home That’s Move in Ready and Loaded with Potential, with 5 Bedrooms and 2 Baths, Numerous Built-Ins, Generous Sized Rooms and A Full Length Covered Porch. On the Main Floor Are Fabulous Refinished Oak Floors, Upstairs Features Old Growth Fir Floors, and Rich Fir Trim and Fresh Paint Throughout. You’ll Find A Great Room Concept In The Grand Living Room and Dining Room Area, with Coved High Ceilings and Original Leaded Glass – The Woodburning Fireplace Made with Stylish Stone Material Is A True Focal Point. Classic Rambler Style. Minutes From the Landing and Waterfront! Calling All Cute Rambler Owner Wanna-Bes! Move-in Ready Robinswood Rambler Filled with Comfort & Style, Highlighted By An Abundance of Beautiful Trees & Lush Setting. Built in 1956 and Nestled In A Nature Lover’s Paradise, This Stylish 3 Bedroom, 1.75 Bath, 1,480 Sq. Ft. Rambler Features Numerous Updates On A Spacious and Flat Corner Lot with 2014 Taxes of $3,084 – This Quiet, Safe, and Desirable Neighborhood Includes Spiritridge Elementary, A Top Rated School. A Rare Gem with Loads of Upgrades and Amenities, Ideally Situated in a Phenomenal Location – You Own the Land! Single Family Home Feel with Convenience of A Townhome Awaits You in This Friendly Complex. Well-Managed by Owners! Imagine a Serene Style of Living in An Outstanding Issaquah Location in This 2 Bedroom, 2.5 Bathroom Townhome with Secure Garage, Including 2 Deeded Parking Spaces and Tons of Storage Space – Built in 2009 with Energy Star Certified Appliances. Welcome to “The Bluff” a hidden secret “Gold Coast” of Mukilteo! At “The Bluff” in Mukilteo’s Gold Coast~this pristine custom home has magnificent Sound and Olympics views! Graced with a grand entryway. The pretty center-island Chef’s kitchen adjoins the family room. Refinished hardwoods, 2-brick fireplaces, den, 6-panel doors and tons of wood trim and millwork. Glorious view master suite: jetted tub, heated Italian floors, walk-in closet. Formality of living and dining room with wall of windows and vaulted ceilings. There is a room up by the master that is unfinished and currently being used for storage but it is framed and could be finished as a 4th bedroom, bonus room or nursery. Flawless grounds, newer deck for sun~fun~sunsets. Close to Boeing and Ferry. Classic Quadrant Home with A Big, Open Floorplan and Terraced Back Yard, Moments from Mill Creek Town Center! Don’t Miss Out on This Traditionally Styled Two Story 2,468 Sq. Ft. Home. Built in 2004 and featuring 4 Bedrooms, 2.5 Baths and the Larger Living. Spaces that Quadrant Homes Are Known For! This 3 bedroom 2.5 bath plus den/office or bonus room, family room, living room and dining room has been completely remodeled, most everything is new! Beautiful estate on a lush and private acre+ lot. This Stylish & Classy Townhome in Issaquah Will Not Disappoint! This Classy Townhome Will Not Disappoint with Miles of Hiking Trails and Acres of Green, All Just Moments to I-90. Don’t Miss This Single Family, Zero Lot 2 Bedroom/1.75 Bath Townhome in One of The Eastside’s Most Popular Neighborhoods, Built in 2012! GRAND Lords Hill 4 Bedroom, 3.5 Bath Chalet with French Country style! A stunning estate on 5+acres of privacy, pastures, build-a-stable=bring your horses! River and valley views of balloon rides, colorful sunsets, peaceful. 20+ ft soaring ceilings, main floor 5-piece master ensuite lavished in marble. Chef's kitchen a gathering place, infused by limestone, travertine, stainless steel appliances, envious granite, chandeliers. It's all here! Wine cellar, decks, mud room, bonus room and office.Circular driveway, forts, trails and wildlife. Fall in love with this updated Craftsman located near it all! 2 bedroom, 2 bath, bonus room up, tall ceilings on main with coved arches. Classic crown molding/designer "Devine" paint/newer gas furnace/A/C/newer light fixtures and bamboo floors in bedrooms. Lower level is versitle with a bathroom and surround sound for movie nights or guests. Huge laundry room! Chefs kitchen with tons of counters and stainless steel appliances. Hardwoods on main, newer windows, fun spiral staircase to lower rec room with new carpeting and storage. 10 Minutess to downtown Seattle and Stadiums. Extraordinary presentation, Spacious design, Remarkable location surrounded by fresh mountain air & shares only 1 wall. Seconds to I90/Issaquah Highlands/shops and top Issaquah schools. Open dining/living room ~ slider door to private fenced patio, gas fireplace, gas stove, new gas furnace, full laundry. Sunlit, fresh paint, sparkling carpets. Master mini suite ~ walk-in closet, private view deck. Covered entry, just off designated parking spot + Private 1 car gar w/alley access, life is good! Don’t miss this simply adorable 1909 bungalow of 1,990 sq. ft. of total living space featuring 2 bedrooms and one bath in one of Seattle’s most desirable areas: the low maintenance living on a smaller lot makes this home ideal as a condo/townhome alternative. This wonderful home has been in the same family since 1971. Throughout the home you'll find beautiful period details such as 6” floor moldings, picture rail moldings, solid core doors, hardwoods and French doors leading to useful sun room. You'll love the roses, rhodies, lilac and two porches to enjoy on a summer evening. With An Interior That Joins Hands with Pleasing Design Elements, This Home Lives Proud & You’ll Fall in Love!